Alsógál is a trip into the subconscious, a multi-layered web of cross-references and sensorial impulses, unveiling hidden layers within common items or situations. 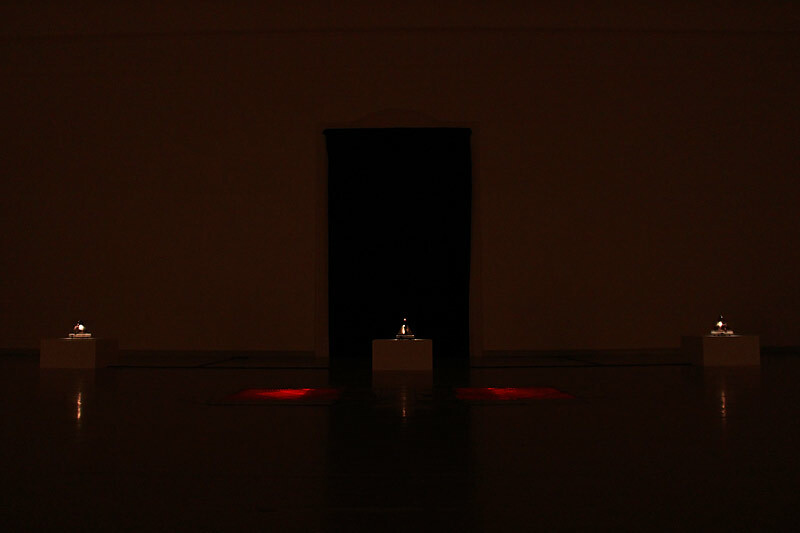 It is an exploration of things underneath, behind, and past: Gál takes select glimpses into the history of the Kunsthalle Budapest and Magyar mythology, as well as reflecting on personal sonic memories. Acoustic and visual elements are assembled into a multi-dimensional art installation, offering a site-specific ‘space choreography’ for all senses. The installation consists of three parts which have been either newly conceived or reconfigured for the occasion. Part I (álmos madár) features the sonification of a mythical creature which is said to point back to the origins of Magyar heritage. Part II (zhu shui) presents the inherent music of three objects of daily use, namely three tea kettles. Finally, part III puts the often overheard soundscapes of domestic life into focus, featuring a new realization from Gál’s work series homesweethomes (2013-). The title Alsógál is a play on words referring to the Hungarian and English meanings of ‘also’, as well as to the composer’s last name and a settlement next to a well-known Hungarian national monument. Part of the group exhibition On the Edge of Perceptibility. Supported by the Austrian Cultural Forum Budapest. Alsógál is featured in Gal's Book & DVD video Zwischenbrücken, edition spce | Gromoga, Austria 2015.